Tom Senior, of Atlas Works, Hightown, Liversedge, Yorkshire, England, began in business by both factoring and manufacturing a variety of useful castings and tools designed to appeal to the model engineer, schools and technical-training institutions. He started his career as an apprentice with Arthur Firth Ltd., almost certainly starting at the age of 14 immediately after leaving school. Firth were long-established in the area and advertised widely in the engineering press selling machines under their own name and also branded as "Atlas" and "JSB". 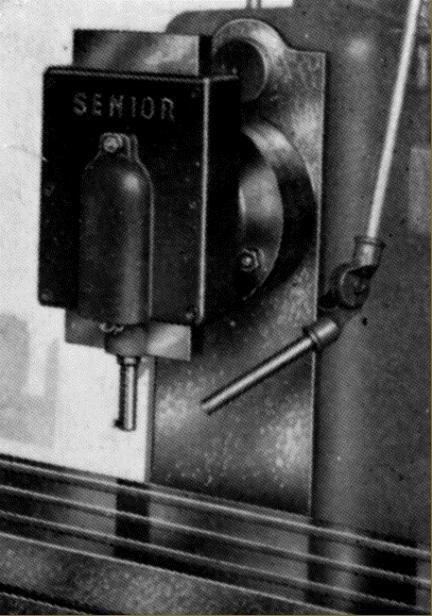 Senior must have had a particularly well-developed mechanical aptitude for, by the age of 19, in 1919 he had risen to the position of foreman Although this is pure conjecture, he must have found such a position of responsibility difficult to handle, not through any lack of practical knowledge or skill, but because of what must have been many awkward situations when he had to deal with men far older and more experienced than himself - "T'young bugger, he knows nowt…". So, with just £3 in savings, and not yet at his majority (at the time 21 years), he decided that the time was right to branch out on his own. Fortunately, he had excellent relations with his previous employers and would, as was the custom, have undertaken a good deal of (not very profitable) sub-contact work on their behalf. As Senior's business grew so he took on the role of tool and machine-tool distribution, handling the Firth lathes and hand planers - long a staple of the company according to contemporary advertisements - and possibly buying in casting made from Firth-owned patterns as demand dictated. By 1925 Senior had expanded sufficiently to take over the Firth business with an advertisement in the Model Engineer and Light Machinery Review announcing that "Atlas" products would now be made by Senior. 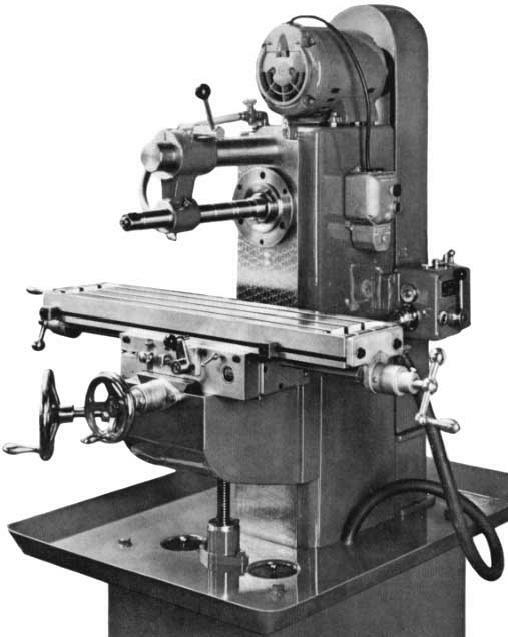 At the end of the 1930s Senior's range of products was considerable and he was publishing a catalogue packed not only with machine tools but also a wide variety of engineering accessories: lathe fixed steadies, machine handwheels, plumber blocks, gear-cutting and dividing attachments, compound slide rests and tables, drilling and grinding spindles, machine vices, vertical-milling slides, angle plates, vertical milling attachments for horizontal millers, surface plates, lathe changewheels, countershafts, pulleys, shafting, Morse centres, V-blocks, model and full-size gas and petrol engines, dynamos, carburettors and numerous smaller engineering items. 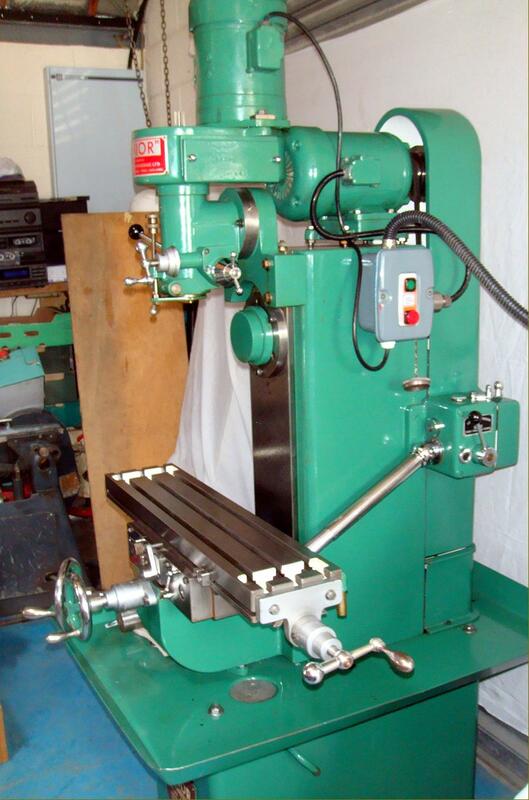 The Senior machine-tool range encompassed a number of different drills, several varieties of shapers, planers in sizes 00, 0, 1, 2 and 3 as well as light-duty horizontal millers and two sizes of lathe. The company's larger machines were always available as complete, working tools or as bare castings - or even in various stages of completion for final fitting and assembly by the purchaser. 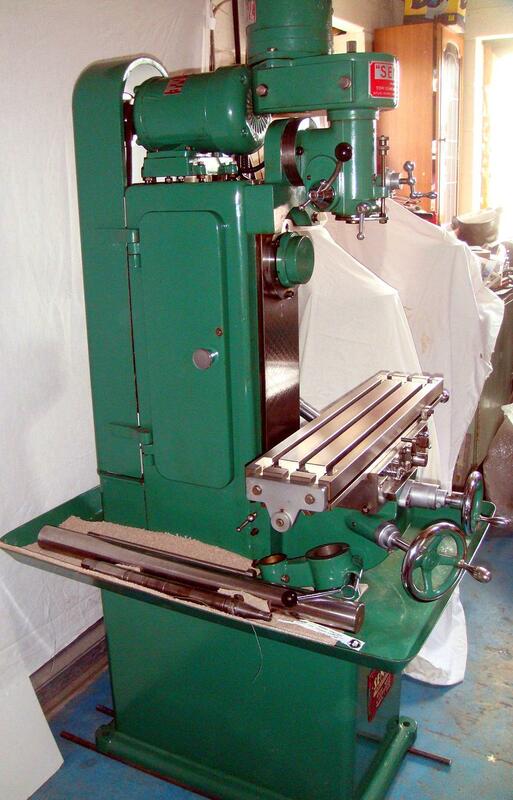 Unfortunately the smaller products - shapers, planers and drills - appeared not to survive WW2 and, by the time peace returned in 1945, Senior (who always operated from an almost cottage-industry site), was concentrating on his new range of horizontal, vertical and universal milling machines. Tom Senior millers were always noted for their superb finish - the catalogue claiming, quite justifiably, that: "the paint work is superb and all machines are sent out with Exhibition Finish, being beautifully hand frosted". Although over the years a variety of machines were offered including the E Type, Junior Horizontal/Vertical, Light Vertical, VS and Major ELT the mainstay of the new range was the machine shown below, the M1. With both a 3-speed direct belt drive and a lathe-like "backgear" slow-speed drive built into the main column (the latter mechanism also incorporated a two-speed belt drive), this very robust little miller had twelve spindle speed of: 60, 86, 104, 136, 169, 267, 329, 537, 642, 845, 1050, and 1660 r.p.m. 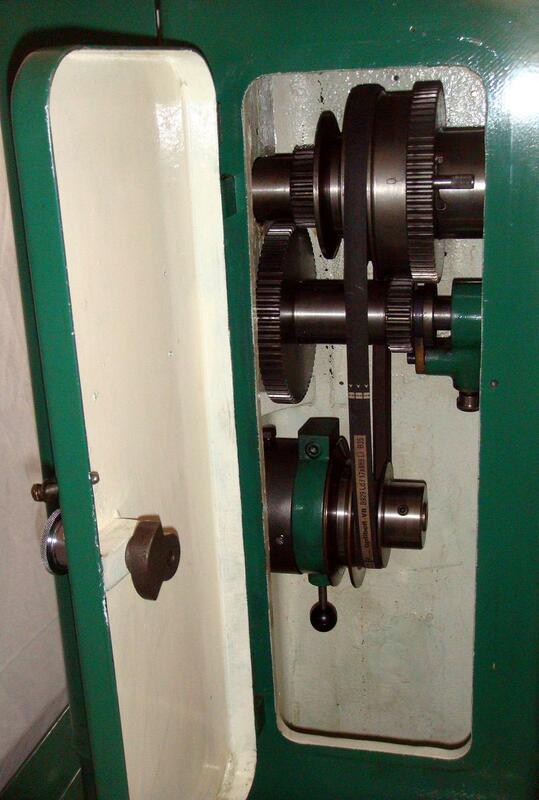 The 2-speed backgear assembly was an important addition for it did much to extend the scope of the miller's versatility - especially the ability to take very heavy cuts when used as a horizontal machine Instead of being flange mounted, and buried deep inside the oily recesses of the machine, the 1 h.p. 3-phase motor was fastened to a height-adjustable plate, conveniently mounted on top of the main column thus making motor replacement a simple matter - it being possible to fit almost anything to hand that was powerful enough. 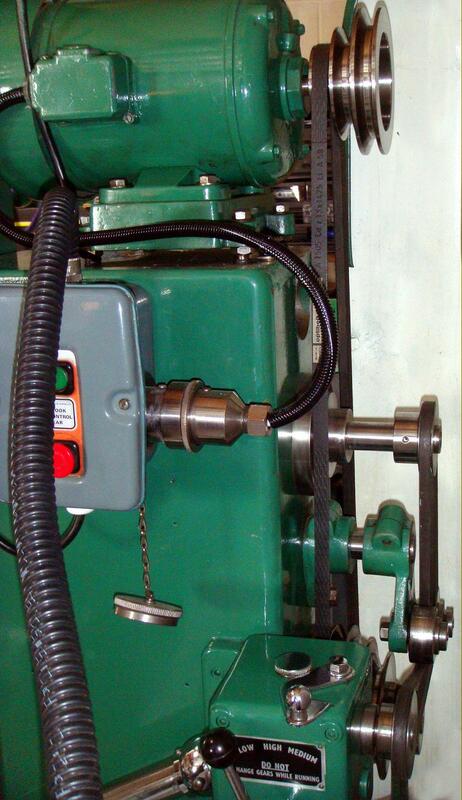 The spindle ran in Timken taper roller bearings and was fitted first with a No. 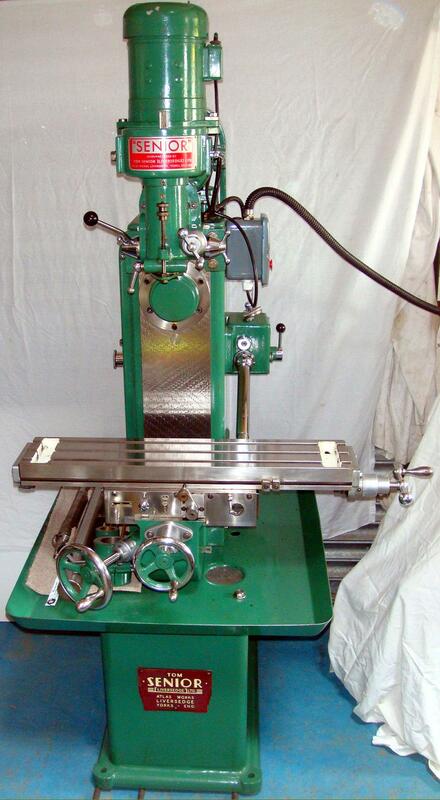 3 Morse taper and then, following the general machine-tool trend, with the superior No. 30 International - a type that allowed heavier cuts to be taken yet with greater ease of removal and replacement. With three T slots the 28" x 6.25" table, was powered through a 3-speed gearbox, driven from an extension to the rear of the main spindle via a Y-shaped arm that functioned both to tension the belt and keep the drive behind the main column where it could be safely contained inside the large, cast-aluminium rear cover. 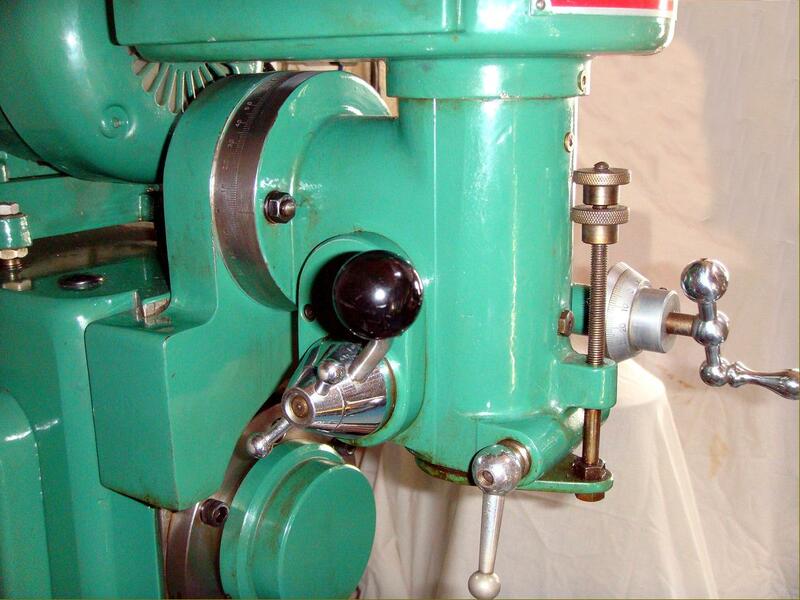 Whilst early table drives had a simple, exposed drop-in worm and wheel arrangement, later models were fitted with a more durable and robust oil-bath gearbox. 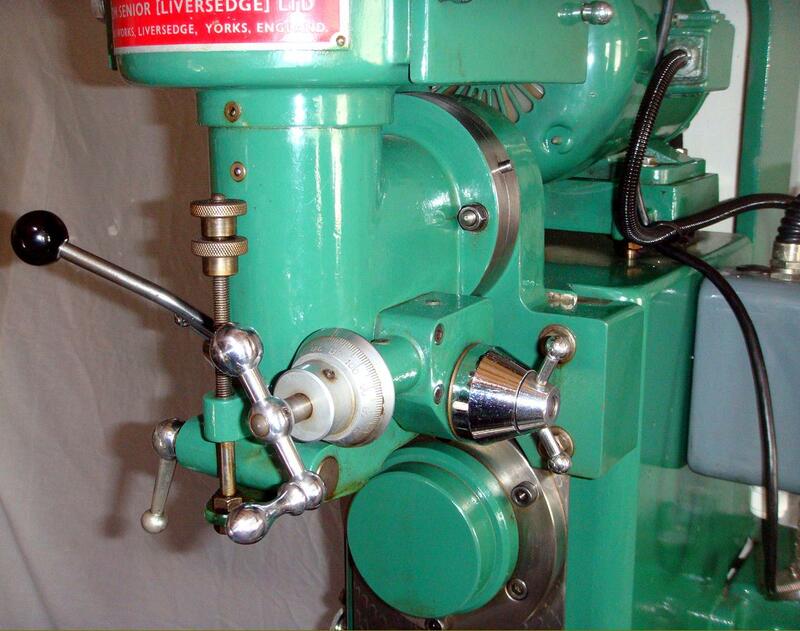 36 rates of automatically-disengaged feed were available (3 per spindle speed) from 0.25" to 28" (6 mm to 711 mm) per minute. The maximum longitudinal travel was 15.5", the cross 5.5" and vertical 14". 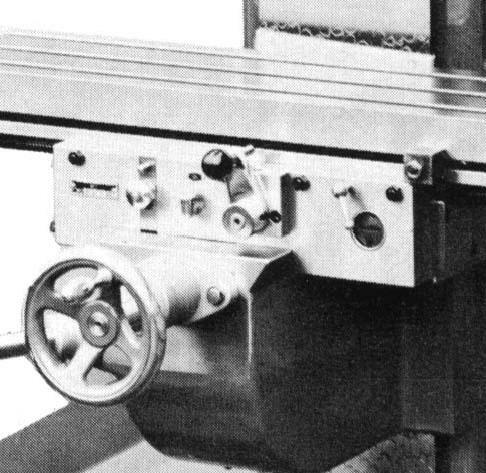 Although the hand feed was normally by screw, some versions were made with a rack-and-pinion drive to make them more suitable for certain types of production work. The suds pump was driven by a plastic belt from a groove formed on the end of the lower main drive pulley. The machine stood 63" high, was 41" front to back, 38" wide and weighed a little over 7.5 cwt (372 Kg). Very similar to the M1, the Major was fitted with a wider knee that supported the saddle slide on its outer sides rather than in the middle. The table was a little longer, at 31", but of the same width and with an additional 3.5" of travel; some machines were fitted with even longer tables, offering up to 22" of longitudinal movement and an increase in cross travel to 7"; however, the vertical travel on these models was always listed as being one inch less than standard. The drive system was identical to the M1, as was the speed range, but the horsepower of the motor doubled. When fitted with the optional vertical head - especially the superb swivelling S-Type with fine and quick-action quill feeds - these machine makes an excellent all-round workshop miller and good examples are greatly sort-after..
Senior "Major" with its wider knee and better supported cross slide. The sought-after S-Type vertical head. Flange-mounted at the top, the 0.5 h.p. 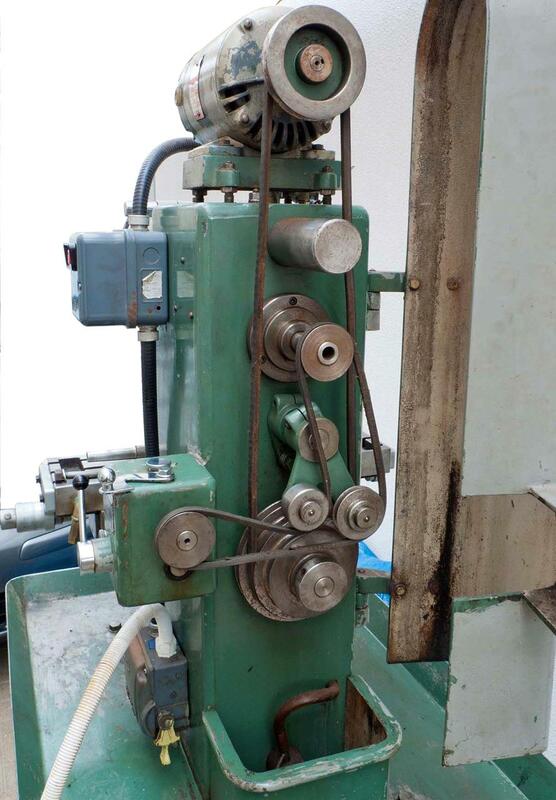 motor (1-phase or 3-phase) drove forwards by a Z-section V-belt to a spindle whose 2.5-inch travel quill was equipped with both fine and quick-action drilling feeds - the former being engaged through a cone clutch, exactly in the manner of that used on the Centec vertical head.. 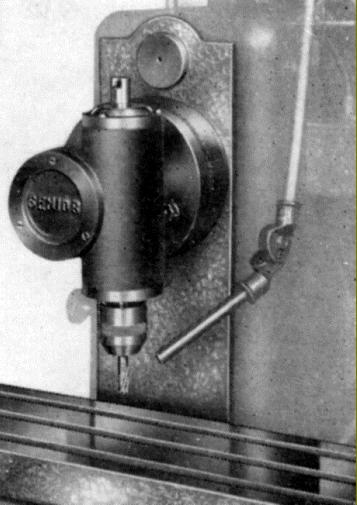 The spindle ran in precision-class Timken taper roller bearings (with a needle roller bearing at the tail) with early machines having four speeds from 480 to 2760 r.p.m. on a 3-phase supply and from 500 to 2,800 on 1-phase. Later versions had six speeds (though with the same speed range) - or a very effective electronic infinitely-variable speed drive unit.